Fun — Jessica Bodford, Ph.D. I'm grateful for ASU's Devil X program, which provides gym classes (yoga, pilates, P90X, self-defense, interval training, etc.) to students and staff at reduced prices. I'm also part of the Arizona Road Racers and am training for my second half-marathon. As is evident below, I don't. Arizona summers are to blame. Exploring has always been one of my favorite hobbies, and Geocaching has always been a great way to learn more about even my own backyard (metaphorically speaking -- my backyard is a rectangular expanse of rock and stubborn desert weeds). If you're also a Geocacher, look me up under jaebs. 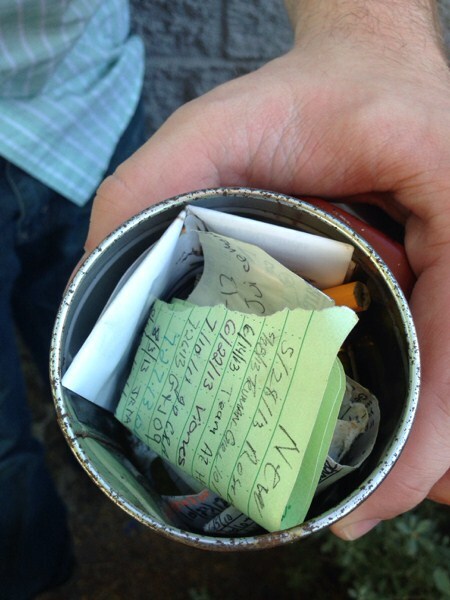 Nerd FYI: the picture to the right is of my first Geocache (October 2013) in Chandler, Arizona. Regarding my love for exploring, please click here for my travels through France, the Netherlands, and England. For key photos from this trip, please click here. For photos and memoirs from my explorations in Israel, Lebanon, Palestine, Jordan, and Syria, please click here. I'm also a huge Game of Thrones, Harry Potter, and Chronicles of Chrestomanci nerd. In my hipster defense, I loved all three series before they were famous.